First, I would like to thank His Holiness the 42nd Sakya Trizin for his guidance, patience, and trust in me as appointed President of Sachen Foundation. I would also like to thank Khyentse Foundation’s Executive Director, Cangioli Che, and Investment Committee Chair, Isabel Pedrosa, for sharing their valuable insight and experience with us. As a new foundation, we strive to follow in their footsteps and manage a successful non-profit organization, supporting many meaningful Dharma projects and practitioners. In 2018, we faced many challenges as a growing foundation, but also accomplished some major achievements. 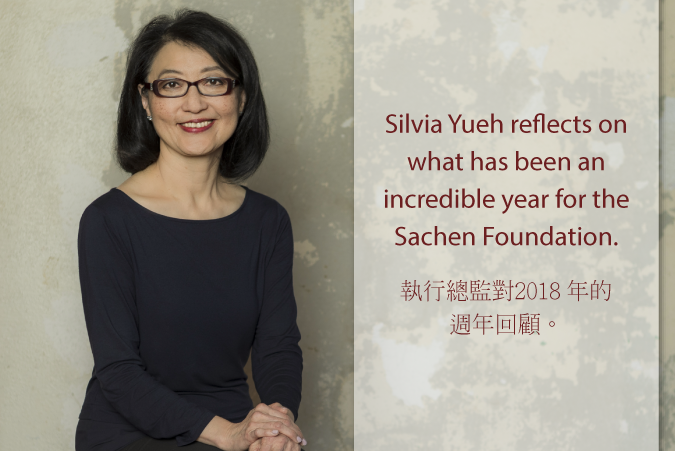 2018 marked the first full-year of operations under the name “Sachen Foundation.” We finalized our board of directors with a total of 12 members. Our website got a new look. But our most notable achievement was the kickoff of our first grant cycle, and the awarding of grants to five worthy recipients: Sakya Centre Education Department, Sakya Academy, Sakya Nunnery, Sakya Kalimpong Monastery, and Melody of Dharma magazine. This was a result of the collective synergies between our donors and the Sachen Foundation team. Without our generous donors, the Sachen Foundation would not have been able to begin granting in our first year. As such, I would like to give my heartfelt thanks to everyone who supported us in 2018. Our donors came from 7 countries and 13 states in the United States. By working together towards a common goal, you all have made it possible for the Foundation to carry out its mission. Donors’ wishes to support Dharma education and publication based on the priorities set by His Holiness, the 42nd Sakya Trizin. We are currently focused on Dharma education and publication of the Sakya Order. One student said it well: That while we see the trees, His Holiness sees the forest and knows best what is needed and how to prioritize projects. Efficiency and transparency in collecting donations and making grants. Our responsibility is to make sure donations are well-managed and invested prudently, and that grant recipients use the funds according to the guidelines set forth in their grant agreements. Legacy giving by donors who wish to make a lasting impact. By using the income generated from investments, we can ensure the Foundation’s continuity in awarding grants that support Dharma education and publication for generations to come. In 2019, our focus is to reach the fundraising goal of accumulating potentially two million dollars in the Sachen Fund by the end of the year, with the maximum matching of one million dollars from a charitable fund. If we raise $500,000, we will get $500,000 in matching dollars, for a total of $1,000,000. But if we can raise $1,000,000, we will get $1,000,000 in matching dollars, doubling the Sachen Fund to $2,000,000. Together, we have already made an impact in the world, by upholding the Dharma through our five grant recipients. Let’s not stop there. There are still many things to accomplish in 2019. I truly believe that with our collective efforts, between donors and the Foundation under the wise guidance of His Holiness the 42nd Sakya Trizin, we can bring about greater positive change. I hope you will join us this year, and help us achieve our fundraising goal. Please email us at info@sachenfoundation.org if you have any questions regarding the Sachen Foundation.